The Utah DOT – TAMP [DRAFT] is available here. 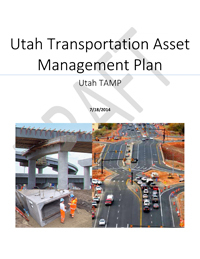 A previous published draft of this document is available at: http://www.tamptemplate.org/wp-content/uploads/tamps/025_utahdot_draft.pdf or at: http://issuu.com/udotu/docs/utah_tamp_posted_7-21-14_f483d30aa2ee2e. This document includes the following sections: Asset Valuation, Current Methods and Tools, Financial Plan, Introduction, Inventory and Condition, Investment Strategies, Lifecycle Management, Objectives and Measures, Performance Assessment, Risk Management.